It has been some years since I have been on the forum so I come seeking advice to anyone who would be kind enough to share it. I am a 39 year old husband, father and huge history nerd. I love studying everything from deep ancestry to material culture to ancient warfare. One of my biggest goals in life was to acquire a few nice artifacts that might represent some small part of my ancestral heritage. Mostly to used as an educational tool for friends and family and to also have a physical connection to a wondrous and incredible ancient past. All this to say, is that I have finally saved enough funds to recently purchase a Middle La Tene sword from an auction house in Austria. The only provenance is that it have belonged to an older private German collection and that it may have been found in Austria or Hungary but that is uncertain. What I find interesting is the overall length being 39 inches and the use of a bronze scabbard instead of iron. However, only the front plate of the scabbard survived and includes some simple motif at the top. For some reason I thought that the longer La Tene swords were more common in Northwestern Europe and that bronze scabbards were more often found in Britain. I will include these photos and humbly ask that if anyone would be willing to comment on its possible origin, then I would certainly be grateful. Thanks everyone for your time and consideration! Update to details of sword, it is actually 37 inches. 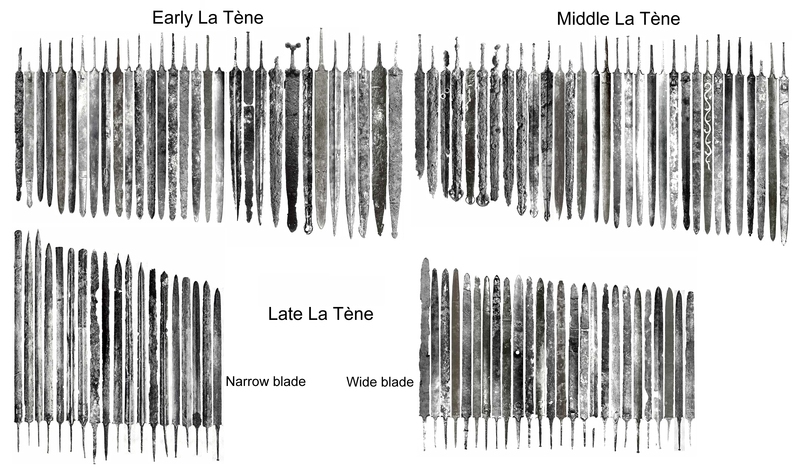 I'm not a La Tene sword expert, but I just wanted to add this image of different finds of La Tene swords. So your type is one with a raised midline and no grooves. Fairly simple un-elaborated guard and the blade ending in a broad point (so not the cut-off type). It seems you can find some comparables to your sword in the early/middle La Tene types given in the image. Thanks for the response and info! That size and blade shape, mid to late la tene, I would say. Thin grooves are rather unique element, so they aren't very useful for dating. Thanks for this information, Luka. Can the simpler shape of the guard be used for dating; or it is size and blade shape mostly? Without provenance it can't be dated any more accurately. We can't even be sure that it is La Tene. the more I study items, the less I'm comfortable with half of them. Prudence is critical in this.